He seemed like he was taken back or something and so I tried to hand it to him but he almost seemed to think he had to pay and he really wasn’t getting it. Then I said “It’s for you.” Then he got excited and said, “For me?” So I gave it to him and we were both very happy! Brother Aaron Hardy and I were walking by an elderly gentleman in a wheelchair waiting at a bus stop. Brother Aaron asked him if he would like a Message book and the conversation started. It wasn't long before his bus arrived, but having a bus pass, I decided to hop on with him and continue the conversation. 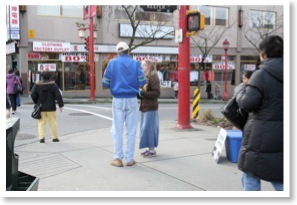 I was with him right up until we ended up at a dollar store, all the while seeking words to perhaps lead him to Christ. The clerk at the store noticed my Bible while I stood with the gentleman in line. The clerk told me he had become a Christian eleven years ago in Iran. Upon mentioning the brother I know from Iran, Brother Matthew Dehkurdi, the clerk said he knew him. I had been keeping an eye on the man in the wheelchair while speaking with the clerk, but then I had only taken my eyes off the man in the wheelchair for half a minute and I couldn't find him anywhere afterward. He just disappeared. I gave the clerk a book and spoke to him briefly. I looked all over the mini mall, but couldn't find the man in the wheelchair. He was slow too! I believe God orchestrated all this to meet this Iranian brother. At the Chinatown witness, we were standing next to an alley and us boys were just starting to have success passing out more books. About 2:30 pm, Victoria Andes got the attention of a Spanish-speaking person. She offered him a book but he said he didn't speak Chinese. She tried to explain that there was English in it too, but wasn't having success. So I stepped in and gave him a Message book and he took it and asked if I had Spanish and I said no. So I told him about the Message HUB and he asked if we handed them out, but I told him he could print it. Just before he left, he pointed to the book and said, “I like this.” So I think he could be a Christian. "I had a wonderful time seeing some young men’s eyes light up while sharing about the reality of un-believers, make-believers, and believers in every church after handing them the Message book by Brother Branham, Three Kinds Of Believers. 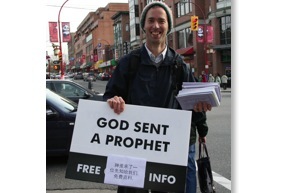 I also had a unique experience when a local "street kid" (whom spoke Chinese) began to help me hand out some Messages. Little is much, when God is in it."